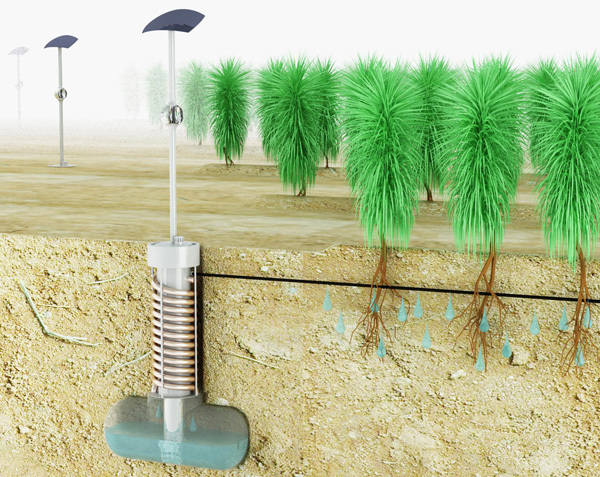 The AirDrop irrigation system extracts moisture from the air. 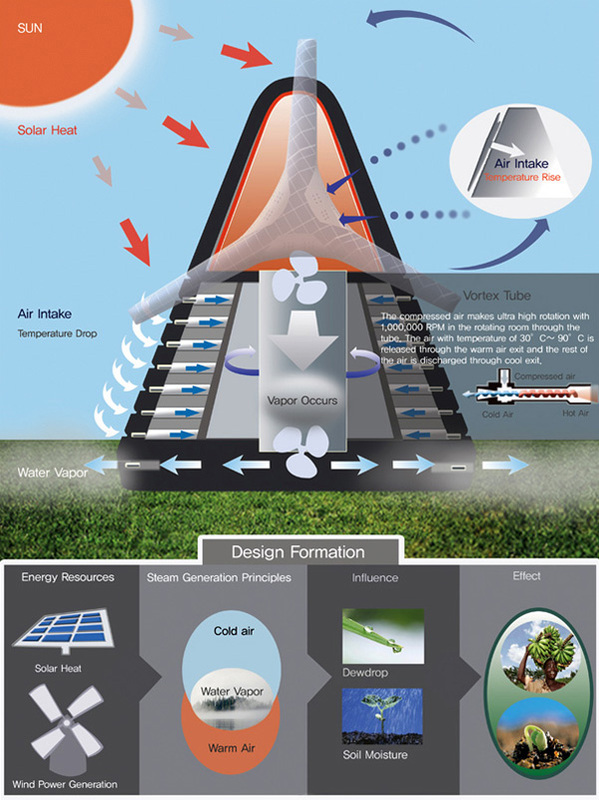 Developing efficient methods for extracting moisture from the air (condensing atmospheric humidity) has long been a goal of scientists and engineers. The AirDrop irrigation system by Edward Linnacre is one of the more recent inventions for extracting water from the surrounding air. 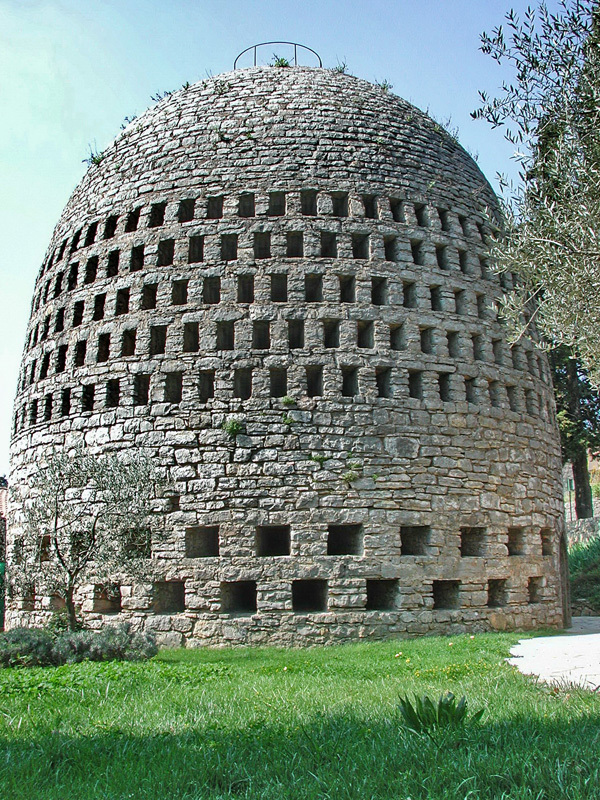 Belgian inventor Achille Knapen built an air well on a 600-foot high hill at Trans-en-Provence in France. The unique air well structure by Achille Knapen was described in Popular Mechanics Magazine, thus: “The tower… is about 45 feet tall. The walls are from 8 to 10 feet thick to prevent the heat radiation from the ground from influencing the inside temperature. 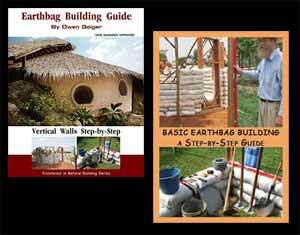 It is estimated that the aerial well will yield 7,500 gallons of water per 900 square feet of condensation surface.” Note: the walls could be much thinner and thereby much less resource and labor intensive if made with earthbags, because earth doesn’t conduct heat as rapidly as stone. Add vent tubes instead of building square vents. The exterior could be plastered or covered with one layer of stone on top of rough plastered earthbags. Im interested as well in these amazing technology. And I thought about installing this technology in many places other than drinking water such as: in Car (wind wiped tank and coloent tank). Also, using this technolgy in building me own water well in the middle of desert. In addition, installing one in home water tank so that I can save water bills. For those interested in learning about the scientific and technical aspects using water-from-air systems, there is now available from amazon.com a book, “Water-from-Air Quick Guide”. We are interested in this technology. Very interesting. What is the possibility of testing this inventions in other countries? You’ll have to do deeper research for the details. This blog post just scratches the surface as far as technicalities. It’s main purpose is to draw awareness to these concepts. Click on the Subscribe button on the right side of the page. 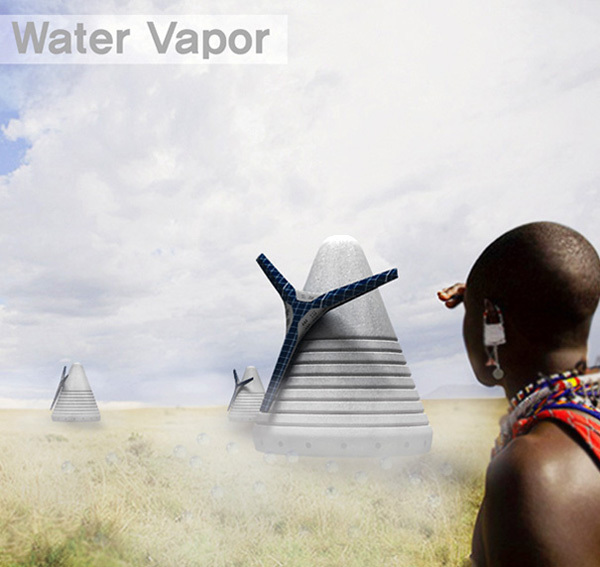 And for single-family households, there’s also the Water Mill (http://inhabitat.com/the-watermill-produces-fresh-drinking-water-out-of-thin-air/). Yes, there are lots of standard, commercially available devices, and this may be the most practical solution for most. I tend to focus on low tech and unusual DIY alternatives.